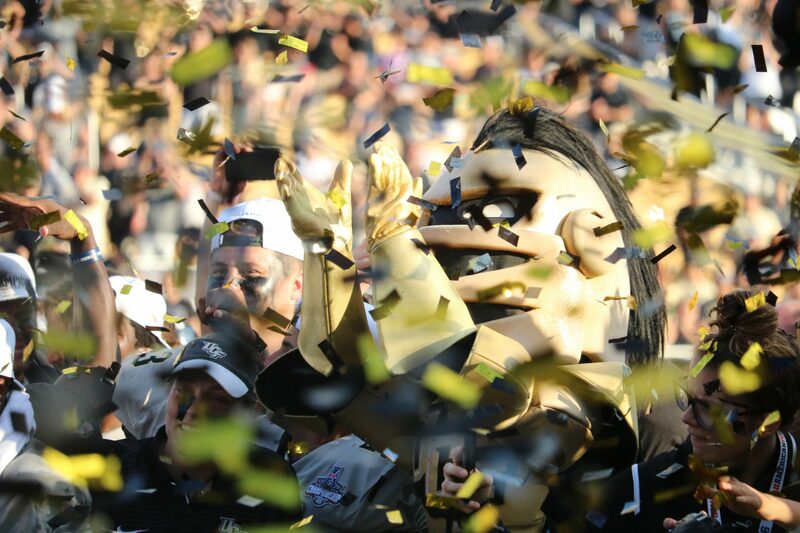 ORLANDO, Fla. – UCF wins the American Conference Championship, capping off an undefeated regular season. It was a hard-fought double-overtime victory versus a tough Memphis team. The final score was 62 to 55, the highest scoring conference championship game in NCAA history. It was a back and forth game all day, UCF held a 14-point lead late in the fourth quarter, and had survived multiple lead changes all night. Both teams had opportunities to win in the last 2 minutes of the game, neither capitalized. In overtime both teams scored with relative ease. In the second overtime Riley Ferguson threw a slant pass and Tre Neal stepped in front, and the celebration began. “Chequan Burkett told us, ‘you know what boys I love all of y’all,’ and that goes a long way, I think that is why we prevailed,” said Tre Neal about the mindset of the defense in overtime. The UCF fans came out today. This place was packed, and it was rocking. For back to back weeks this team got to understand what a true home field advantage feels like. Not one of UCF’s scoring drives were longer than 4 minutes, highlighting the UCFast attack primed by Frost for two years. Coach Frost showed his soft side today, fighting off emotions for the entire post-game procedures. The press conference was a love fest between himself and his adopted sons as all the players kept repeating the words family and love. Frost didn’t speak much, but poorly held back tears. These two teams totaled for 1,479 yards of offense, big play after big play. It was truly exciting from start to finish. McKenzie Milton had many of those yards, 562 to be exact. Milton totaled 5 touchdowns on the day. Not everything was peachy today for Milton though, he threw 3 interceptions. That’s very out of character for Milton, he only had 6 interceptions all season prior to today. In overtime he stepped up, leading the team to back to back touchdowns, and ultimately a conference championship. “I can’t believe how much he has grown up since he has been here, he is like a son or little brother to me,” Frost said on his relationship with Milton. Shaquem Griffin had an unbelievable last game at Spectrum Stadium, sacking Riley Ferguson twice on key third down plays. Griffin has a motor, despite the cliche’ expression – he can be relentless when going at the quarterback. Griffin faces double teams, and often it doesn’t matter. He is too fast for most tackles in the American Conference. “Eighteen has some of the most courage and biggest heart I’ve ever seen,” Coach Frost said about Shaquem. “He is going to make a lot of money playing this game, and I can’t wait to watch it. Big names were on UCF campus, and once again they delivered. UCF will have one more monster test, probably around the new year. With an undefeated season and conference champinoship in the books, a likely New Year’s Six berth looms at the final mountain to climb.